Start the ignition on the Mustang to begin the Big Sur roadtrip. Clock turns on showing 9am precisely. Nothing strange about that except that the two previous mornings of our road trip we have, without planning it, started the car at precisely 9am. Spooky. We continue south even though our final intended destination is north. South of Carmel begins one of the most scenic drives of the world. Think Great Ocean Road of Victoria, Australia or Cabot Trail in Nova Scotia, Canada. A twisty windy road working its way around clifftops and down to beaches and back again. 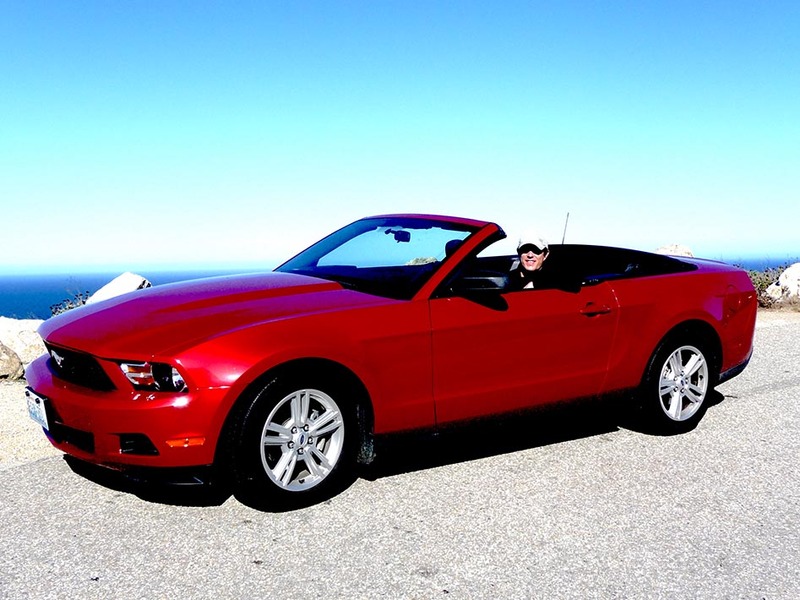 It is a perfect ‘fall’ day with blue skies, sun high and bright in the air and cruising along in the mustang with the roof down is the perfect vehicle in which to be doing this. It is 26 miles to Big Sur which is more an area signifying half way along this road than a specific town as such. Big Sur being a complicated name as Sur is ‘South’ in Spanish, yet Big is ‘Grande’. So they have gone for this hybrid Spanglish name, which is fine if that’s what intended as it’s not a bad name. Perfect vehicle to take along a Big Sur drive. Although we weren’t the only ones on the road today though. Other sports car types looking to take their babies for a run and enjoy the spectacular weather. Passing a Triumph sports car club in convoy, having some experience with the model, I was not surprised to round a bend and notice a ‘man down’ with steam shooting from under the bonnet of one overheating Triumph. Same the world over! Headed down to a beach and paid $5 for the privilege to see a dog relive itself on the beach followed by a natural rock archway forged over time by the pounding seas. Back onto the main road for plenty more spectacular sights as we’d become accustomed from the front seats of the Mustang. 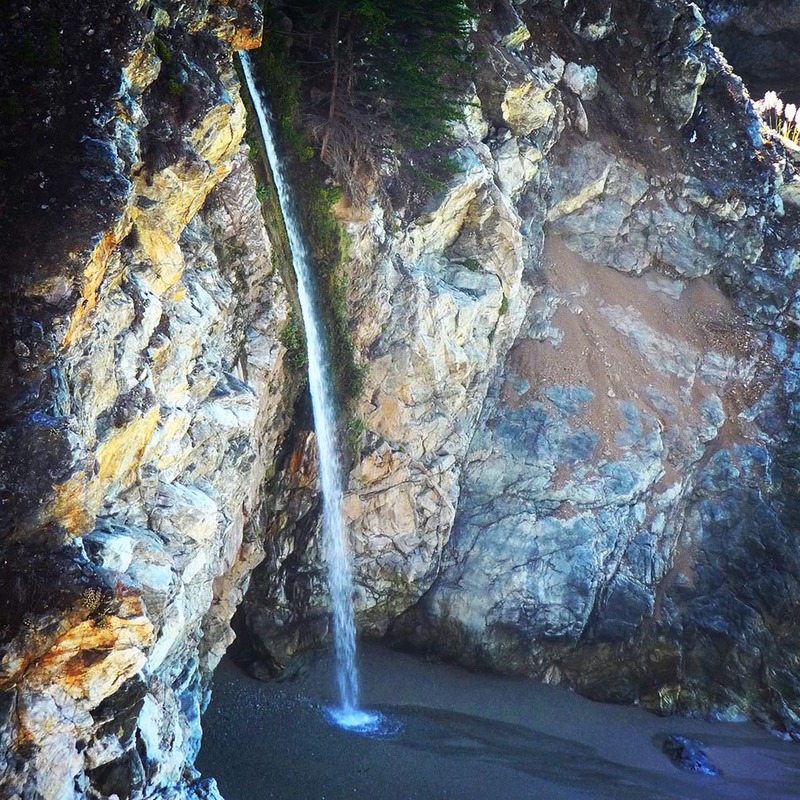 We spied a waterfall shooting from about 80m up the cliff face into the sea below. We stopped at the Big Sur River Inn for a burrito which you needed two hands to lift. Sat on some classic Adirondack chairs which were positioned actually in a shallow part of Big Sur river. Sun filtered through the trees, the river streaming between our feet, just perfect. The only concern being able to eat a gigantic burrito. We were currently 30 miles south of where we started the day in Carmel. Carmel was about 60 miles south of San Francisco. Our planned destination this evening was 60 miles north of San Francisco. You don’t need to be a maths genius to work out we had a ways to go! Plus we wanted to swing by Silicon Valley to see what all the fuss was about. We turned off highway 101 for Silicon Valley arriving in Palo Alto the heart of this tech crazed hub. We got a little lost so without a Sat Nav or Wi-fi (I had only just got an iPhone) we were struggling a little. We pulled into Stanford university for directions to their alumni organisation of Google. Not expecting a great deal from the ‘Googleplex’, it is an office after all, our expectations were realised with a simple building at the front of a walled compound. The only sign some geniuses of the tech world were behind them being the small sign out the front, a few cars with Google map cameras mounted on the roof and one guy who had a laptop strapped to him so he could type away as he crossed the street! True this was also before the iPad. Onwards we get caught in rush hour just south of San Francisco and spend an hour in grid lock, eating into our stretch target of reaching Napa Valley at a reasonable hour and finding a place to stay that evening. It also began to rain so I attempted in gridlock to close the roof of the Mustang. Note to self, you need to be stopped to close the automatic roof! I got half way but as soon as I was in drive it stopped, meaning we were driving with a half up roof for about 1km until the traffic stopped again. More gridlock and we opted to stay in Berkeley for the evening. We pulled into the The Rose hotel on the main drag into Berkeley. A little room shuffling as we were shown a small room for $100, and opted for a larger room for $110. Then were charged only $100 by mistake. Then the toilet didn’t work. So we were upgraded to a massive room. Still at the $100 rate which the guy couldn’t be bothered fixing.